On the Cover: Strategus syphax (Fabricius). 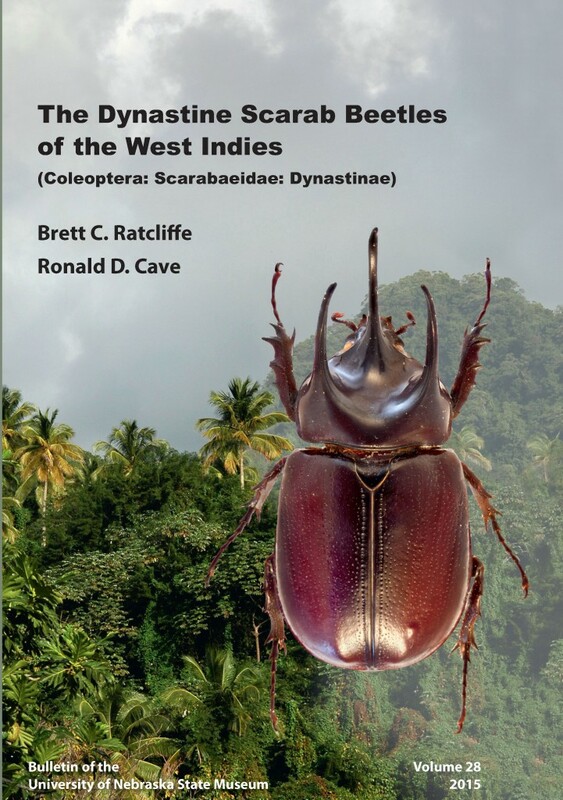 The 85 species and subspecies of dynastine scarab beetles that occur in the West Indies are comprehensively reviewed. Detailed discussions of the paleobiogeography, historical collecting, climate, vegetation and habitats (with images), and islands in the West Indies are presented. Keys to all tribes, genera, and species in the study area are given. Descriptions, recorded geographic localities and temporal distributions, diagnoses, notes on natural history, illustrations and distribution maps are provided for all species. Also included are synopses of the subfamily’s higher-level taxa in the region, a glossary, a species checklist, and extensive references. New species are described and new synonyms established. Brett C. Ratcliffe and Ronald D. Cave. 2015. The Dynastine Scarab Beetles of the West Indies (Coleoptera: Scarabaeidae: Dynastinae). Bulletin of the University of Nebraska State Museum (28). Brett C. Ratcliffe is professor of entomology and curator of insects at the University of Nebraska State Museum.